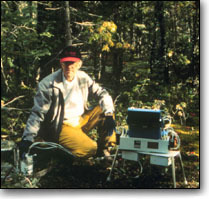 Garlmer Personnel Biographies - Zepp, Richard G.
Photodegradation processes in the environment, the effects of UV-induced photochemical processes on the biological availability of organic carbon and nitrogen in freshwater and marine environments, and biogeochemical processes affecting trace gas exchange between biosphere and atmosphere. Miller, W. L. and R. G. Zepp. 1995. Photochemical production of dissolved inorganic carbon from terrestrial organic matter: significance to the oceanic organic carbon cycle. Geophys. Res. Lett. 22:417-420. Moran, M. A. and R. G. Zepp. 1997. Role of photoreactions in the formation of biologically labile compounds from dissolved organic matter. Limnol. Oceanogr, In press. Zepp, R. G., T. V. Callaghan, and D. J. Erickson. 1995. Effects of increased solar ultraviolet radiation on biogeochemical cycles. Ambio 24: 181-187.